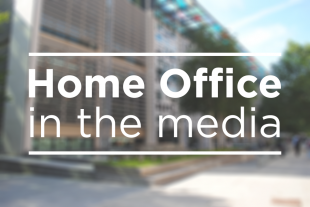 Today's Home Office stories cover a report on immigration detention, an asylum refusal letter and an extradition case. The Telegraph, Guardian, Sun and Independent cover a report by the Home Affairs Select Committee on immigration detention. Coverage includes the committee’s finding that fewer than half of immigration detainees depart the country once released from detention. Reports also suggest that failings have led to people being wrongfully detained. The Today programme also covered the story. In particular, they highlighted a recommendation to time-limit detention. Detention is an important part of our immigration system – but it must be fair, humane and used only when absolutely necessary. We do not detain people indefinitely, and the law does not allow it – most people detained under immigration powers spend only short periods in detention. As the Home Secretary made clear in our response to Stephen Shaw’s follow-up review of the welfare in detention of vulnerable people, we are committed to going further and faster with reforms to immigration detention and a comprehensive cross-government programme of work is in hand to deliver on that commitment. The Independent reports that the Home Office refused asylum to a Christian convert by quoting Bible passages in the case. The article notes that the Iranian national, who claimed asylum in 2016, was told passages in the Bible were “inconsistent” with his claim that he converted to Christianity because it was “peaceful faith”. “This letter is not in accordance with our policy approach to claims based on religious persecution, including conversions to a particular faith. There is widespread coverage of the news that Nirav Modi has been arrested in the UK in response to an extradition request from India. We can confirm that Nirav Modi was arrested on Tuesday 19 March in relation to an extradition request from India. Mr Modi will be taken to Westminster Magistrates’ Court today (Tuesday) where he will face an extradition hearing. While the case is before the Court it would be inappropriate to comment further. The Telegraph covers research from the Higher Education Policy Institute on foreign students. The paper reports that overseas students who study at UK universities go on to earn up to 50 per cent more than their British counterparts. The article notes the Home Office’s Immigration White Paper, saying it would increase the post-study work visa for international students from four to six months for undergraduates and post-graduates. Alistair Jarvis, chief executive of Universities UK, is quoted as saying that the UK should do more to “send a welcoming message” to international students. He proposes that the Government should extended the post-study work visas to two years.